I have a soft spot for cookies. When I was little my mom didn't buy junk food. She baked and cooked all the time, but when we went to the grocery store the packages of cookies stayed on the shelf. So when I went to friends houses for slumber parties, I would eat whole packages of cookies. Then I would stay up all night from all the sugar, but it was well worth it. In college they sold cookies almost the size of my head in the student center and I bought them almost everyday. What I wouldn't do to still have that metabolism. My two kids are also little cookie monsters. They have been known to eat 2 dozen cookies in one afternoon. Since cookies aren't the best food for you, I love finding recipes that make cookies a little healthier. A couple of months back I made a new recipe for Whole Wheat Chocolate Chip Cookies from Betty Crocker, which looked delicious and a healthier version of a family favorite. This recipe has 9 ingredients. It takes 40 minutes of total time, 30 minutes of which is prep and makes 36 servings. All the ingredients are basic and I made no modifications. I did chose to use King Arthur's Flour instead of the brand recommended in the recipe. I love King Arthur's Flour for baking, especially bread and cookies and it is the only brand of wheat flour that I use. As I always do I used organic eggs and butter. I baked my cookies on parchment paper, it makes cookies perfectly cooked and they never stick. Halfway through the baking time I rotated the pan. This prevents burning and ensures even cooking. Watch the cooking times carefully, my cookies were done in exactly 8 minutes. I followed the remainder of the recipe as written. These cookies were good enough that my two boys didn't notice they were made with whole-wheat flour. They were nice and crisp and had an almost nutty flavor from the whole wheat flour. I like that they use whole-wheat flour instead of all-purpose. It's a great way to include more fiber and whole-grains in a way that my kids didn't notice. 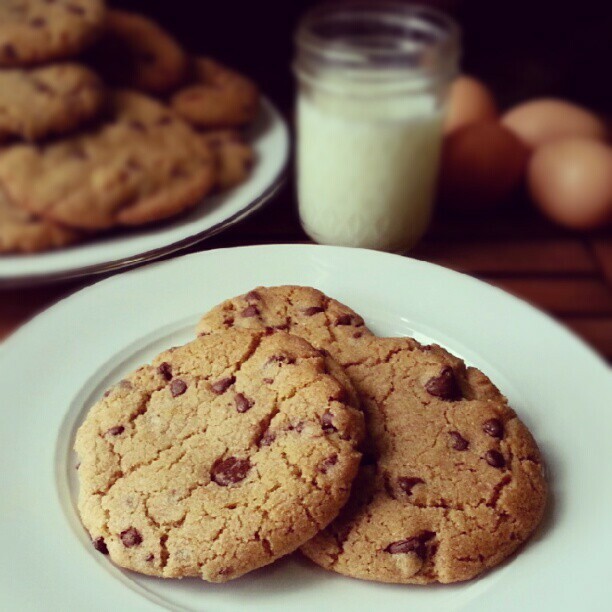 Overall, a kid friendly recipe that tastes just as delicious as cookies made with white flour. For the recipe go to Whole Wheat Chocolate Chip Cookies. stopping in from make my morning blog hop. These cookies look great! I also am a big fan of king arthur whole wheat flour. I usually go 50/50 with it though, or my kids complain (since starting school, I might add...we were strictly whole grain until someone else made sandwiches for them!) Were they soft or kind of crunchy? They were crunchier than a traditional chocolate chip cookie, but my kids didn't notice that they were made with whole wheat flour :) King arthur flour is the best! Good to know I'm not alone :) It can be hard to find great healthier cookie recipes! Hi, I'm a new follower from the Monday Mingle Hop and I can't wait to catch up on your posts. Those cookies look great and honestly think this is first time I've seen whole wheat cookies that I wanted to try. Thanks for sharing!!! Thanks for stopping by my blog....I'm a new follower...where in WV are you I'm in Maryland!!! You had me at chocolate chips! Love your blog and your recipe ideas. Thank you for linking up to Wonderful Food Wednesday. We hope you'll come back and link up next week. Oooh these look wonderful! And bonus points for fooling my four year old into eating something healthy! My three and six year old loved them :) Thanks for the nice comment! I love healthy and yummy :) Thanks for hosting! I love cookies, too! Thanks for the whole wheat variation! i will have to try this! They really are good with the whole wheat :) Thanks for hosting!